Who needs the beach with our great inflatable Beach Volleyball Court! Theres no need to worry about getting a facefull of sand or hard landings with this beach volleyball court! Great entertainment for beach and sport themed events and perfect for teambuilding days. The volleyball court measures 52x25ft but you need to allow an extra 5ft all the way around it. The game can be operated indoors or out but remember the height clearance for indoor events. 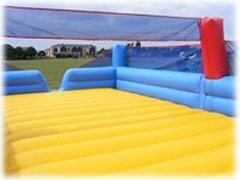 The inflatable Volleyball Court is normally supplied with one of our trained staff members. If you have any queries, questions, or would like to hire the Inflatable Beach Volleyball Court please call us on the number below or click to enquiry and we will do all we can to help. If you're holding a Beach Party themed event then our Surfboard Simulator Ride or Frisbee Golf may also be great additions to your event.